Welcome!! Established in 1989, Twin Rocks Trading Post is located beneath the Navajo Twins geologic formation in the historic pioneer town of Bluff, Utah. 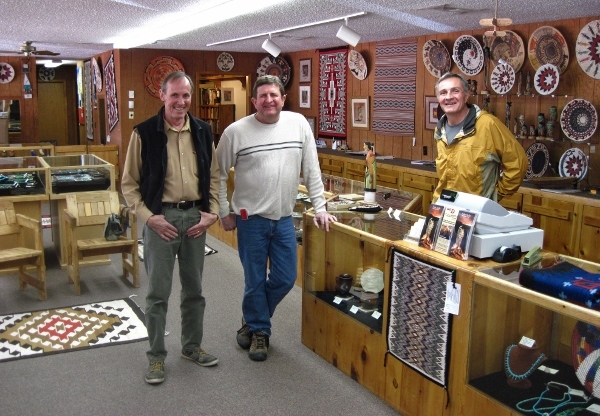 Native sons, Barry and Steve Simpson, share their passion for cultural tradition and artistic innovation with local artists and visiting collectors alike. Their dedication to excellence has resulted in a Navajo basketry renaissance which includes one of the finest contemporary Native American turquoise jewelry collections, and the Twin Rocks Modern Navajo rug — the first Navajo weaving design innovation in decades. “In our trading post, we conduct lively discussions about contemporary American Indian art; publish books and weekly mailings which deepen your knowledge of southwestern art forms; introduce you to a boatload of characters, and present Four Corners regional culture, landscape and creative endeavors on our leading-edge website, twinrocks.com. “When you visit us in Bluff, we promise you a top-notch experience in Native American art collecting. Our friendly team strives to make your experience comfortable, informative and fun. Like many people we have met over the years, we hope you come through our front door as customers and leave as friends. Please contact us @ 1-800-526-3448 or email us: the team@twinrocks.com.